The world's largest clothing retailer, Inditex, has reported better-than-expected profits, despite being hit by poor weather and tough trading in European markets. 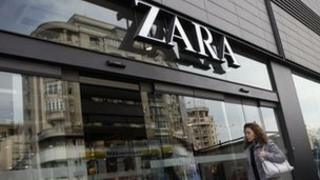 The firm, which owns the Zara chain, said net profits for the six months to the end of July rose 1% to 951m euros ($1.3bn, £798m). This beat forecasts, although the profit rise was its weakest for years. Sales grew by 6% in the period to 7.7bn euros. The Spanish company owns eight brands including Massimo Dutti, Bershka and Pull and Bear. The group opened 95 stores in 40 markets during the first six months of the year, and it now has a total of 6,104 stores in 86 markets. "Inditex has managed to buck the trend by differentiating itself as the trendy clothing retailer around the world," said Joe Rundle, head of trading at ETX Capital. "Its reputation as the more fashionable name in the High Street clothing world has helped the retailer's global footprint."